Sunday 26 1911 I was at home all day. Cold & wintry I wrote a long letter to R G Allen at Billings Montana and to [Womer?] McCall. I read in the evening. 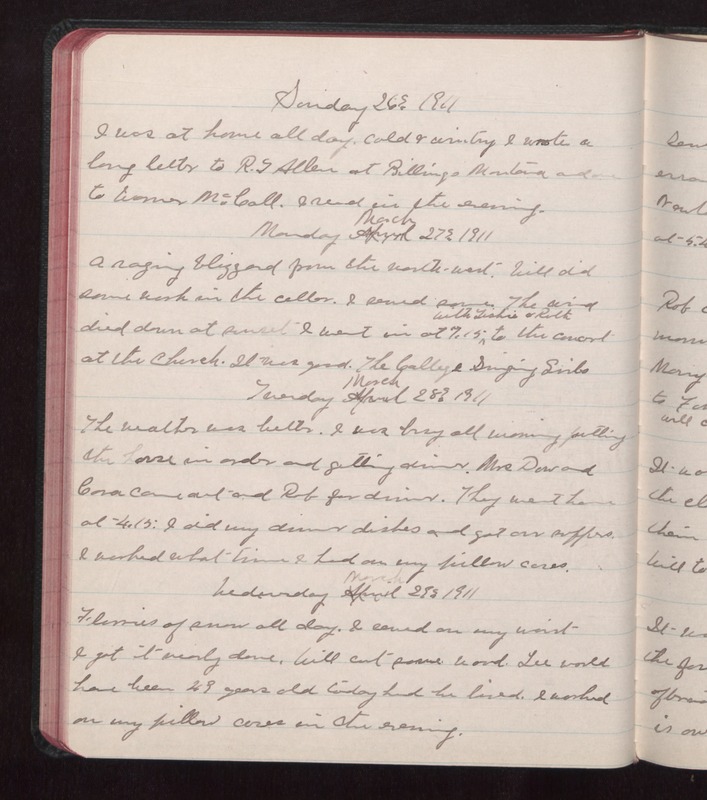 Monday March 27 1911 A raging blizzard from the north-west. Will did some work in the cellar. I sewed some. The wind died down at sunset. I went in at 7.15 with Tishie & Ruth to the concert at the Church. It was good. The Callye Singing Girls Tuesday March 28 1911 The weather was better. I was busy all morning putting the house in order and getting dinner. Mrs. Dow and Cora came out and Rob for dinner. They went home at 4.15. I did my dinner dishes and got our suppers. I worked what time I had on my pillow cases. Wednesday March 29 1911 Flurries of snow all day. I sewed on my waist I got it nearly done. Will cut some wood. Lee would have been 49 years old today had he lived. I worked on my pillow cases in the evening.